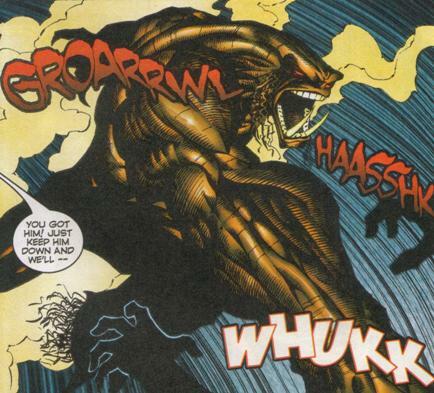 Powers/Abilities: Sasquatch possessed a minimum of enhanced human level of strength that seemed to increase when he went berserk. He also displayed enhanced human levels of stamina, speed and durability. He stood about 15' tall, although a terrified observer once said that he was 25' tall. Being a true Sasquatch, he possessed a decreased mental capacity but had strong animal instincts and was able to travel across most of Canada to rejoin his tribe tracking familiar scents and familiar sights and sounds. He was also cunning enough to hop from train to train to reach his destination. Usually when in combat, Sasquatch fought with a great bestial fury and his strength would increase dramatically, but would fight both friend and foe unless controlled mentally by Murmur. (Alpha Flight II#1/II#6 (fb) - BTS) - The legendary creature known as Sasquatch was reported seen in the North Thompson River between British Columbia and Alberta, Canada, by a hunter. Department H, believing it to be Walter Langkowsi, sent out a contingent of Epsilon guards to capture and recruit him into the newly funded Canadian superhuman program, Alpha Flight. Sasquatch was physically restrained and chained in Department H�s brig to protect everyone from his berserk animalistic nature. He was only able to be reasonably controlled by Murmur using her superhuman powers of suggestion. (Alpha Flight II#1) - Sasquatch was with the rest of Alpha Flight on a mission to prevent terrorists from launching chemical weapons at the city of Vancouver. During the battle with the new Zodiac, Murmur lost mental control of Sasquatch and he began fighting both friend and foe until restrained by Madison Jeffries controlling a large metallic robot arm with his superpower. (Alpha Flight II#2) - Returning from the mission, Sasquatch was physically restrained, sedated with drugs and placed back in solitary confinement within Department H�s Brig. 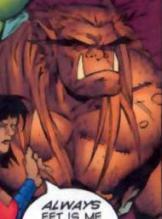 Puck later visited him in his cell and tried to get through to his lost humanity, thinking the creature to be his old friend, Walter Langkowsi. (Alpha Flight II#3) - Sasquatch was sent with the senior Alpha Flight members, Guardian, Vindicator, Puck and Manbot to the city of Orloo to investigate unnaturally violent weather phenomena that was steadily getting worse by the hour. The team tracked the source of the weather emanating from the abandoned Cosmic Collector site and engaged the newly freed Chinook in combat. A brief battle ensued where the beast was buffeted by Chinook's wild winds. With berserk animalistic strength and fury, Sasquatch grabbed Chinook from behind and tore him in half. (Alpha Flight II#4) - Sent with Guardian, Vindicator, Puck and Manbot to retrieve AWOL Alpha Flight members, Radius, Flex, Murmur and the mutant Sunfire who were being mind controlled by Mesmero, Sasquatch again went berserk and attacked both allies and foe. (Alpha Flight II#5) - Murmur regained control of her mind and tried to mentally restrain Sasquatch, believing him to be under Mesmero's influence. Although the mind control was broken, Sasquatch attacked her and threw her to the ground. 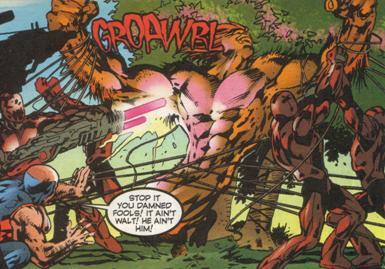 Manbot then attacked Sasquatch using nerve toxin M-11 in order to restrain the berserk team member. Later, recovering from the effects of M-11, Sasquatch - still in a berserker rage - struck Guardian from behind, which unintentionally saved him from killing himself while under the mental control of Mesmero. (Alpha Flight II#6) - Having been chained yet again and placed within a cell, Sasquatch, possibly with the aid of someone else, broke out of his cell by breaking his chains and smashing a hole through the cell wall. Puck was given the task to find him. Sasquatch hopped from train to train and traveled westward. Leaving the train and disembarking near the town of Coventry, Alberta, Sasquatch was photographed by a bird watcher. Later that day, Sasquatch broke into a home in Coventry and driven by hunger helped himself to food. The next morning, Sasquatch arrived at the North Thompson River and was struck by an oncoming semi-truck while crossing the train tracks and the main highway, but was not injured. Meanwhile, the story was Sasquatch's journey through Coventry was covered by CNB News. Sasquatch was later found by a pursuing Puck, but was attacked by the creature once thought to be Walter Langkowski as it was trying to protect his tribe of real sasquatch. During the battle, a contingent of Epsilons and General Clarke arrived and tranquilized both sasquatch and Puck and returned them both to Department H. Puck�s memory of the incident was erased. (Marvel Vision#25) - The Daily Bugle reported that he went berserk and turned on his fellow Alpha Flight members breaking out of the group's complex and then began rampaging across the tundra. (Alpha Flight II#7) - Sasquatch was again placed within a cell and chained to a wall so that he was isolated from the rest of Alpha Flight. He was again visited by Puck who could not remember exactly what had happened out in the woods. (Alpha Flight II#8 - BTS) - Sasquatch was still chained in his cell in the Department H brig. (Alpha Flight II#9/Uncanny X-Men#355) - Department H, having used mind suppressing treatments on the rest of Alpha Flight, reported Wolverine as being a criminal wanted in Canada for committing acts of murder. The team were sent across the border into the USA to apprehend him. Sasquatch, under the mental influence of Murmur, rejoined the team for this mission. Alpha Flight met up with Wolverine who had just apprehended the dangerous mutant Sauron and was returning with him back to the X-mansion but ended up in a conflict. The X-Men were alerted and entered the fight. 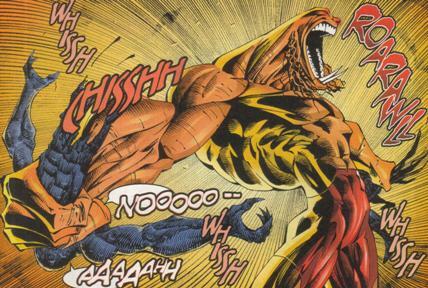 During the battle, Sasquatch used the bound Sauron as a club against the X-Men. Learning that Alpha Flight had been deceived by Department H and General Clarke, the conflict quickly ended and the Alpha Flight returned home to seek answers. (Alpha Flight II#10-11 - BTS) - Sasquatch was yet again confined within a cell and chained to the wall while the rest of Alpha Flight traveled to the Microverse. (Alpha Flight II#12 - BTS) - While the rest of Alpha Flight was in the Microverse, Sasquatch was released from his cell in order to defend Department H from an attack by the Zodiac. (Alpha Flight II#12) - Although Sasquatch was ganged up on by Zodiac members Aries, Capricorn and Leo, he successfully held them off. However, he mysteriously broke off his attack and lumbered away. Soon after, Aries, Capricorn and Leo released a pink giant bacterial super-organism that stripped any living thing it encountered down to the bone. They were closing in on Radius until Sasquatch suddenly re-appeared and grabbed Radius, holding him aloft beyond the reach of the killer ooze, likely in an instinctive effort to preserve one's young. Sasquatch's flesh and soft tissue was quickly eaten away to the bone in seconds as the organism passed over him. (Alpha Flight II#13 - BTS) - Flex asked Radius if he was attending Sasquatch's funeral the next day, suggesting that his half-brother was the reason why Sasquatch had died. (Alpha Flight II#14 - BTS) - Believing Sasquatch was really Walter Langkowski, the creature of legend was buried in a cemetery outside Department H with the service attended by all the members of Alpha Flight. 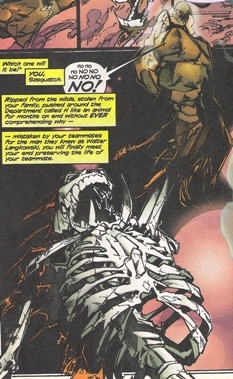 (Alpha Flight II#20 - BTS) - Revealed to be something other than the real Walter Langkowsi, a remorseful Radius attended the creature's graveside and apologized for being the cause of his death for not following orders during the incident with the Zodiac. Comments: Created by Steve Seagle (writer), Scott Clarke (pencils) & Chris Carlson (inks).